Much of this text has focused on techniques for decomposing complex programs into small, modular components. When the logic for a function with complex behavior is divided into several self-contained steps that are themselves functions, these functions are called helper functions or subroutines. 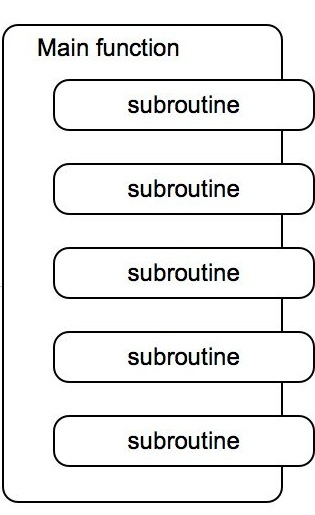 Subroutines are called by a main function that is responsible for coordinating the use of several subroutines. In this section, we introduce a different way of decomposing complex computations using coroutines, an approach that is particularly applicable to the task of processing sequential data. Like a subroutine, a coroutine computes a single step of a complex computation. However, when using coroutines, there is no main function to coordinate results. Instead coroutines themselves link together to form a pipeline. 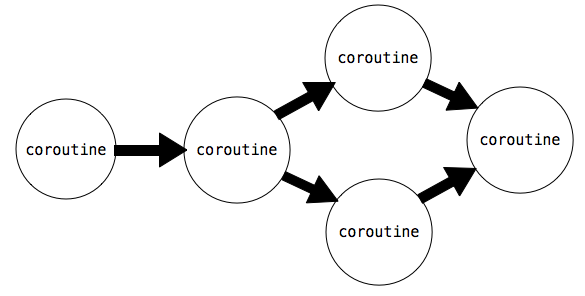 There may be a coroutine for consuming the incoming data and sending it to other coroutines. There may be coroutines that each do simple processing steps on data sent to them, and there may finally be another coroutine that outputs a final result. In this section, we will learn how Python supports building coroutines with the yield and send() statements. Then, we will look at different roles that coroutines can play in a pipeline, and how coroutines can support multitasking. In the previous section, we introduced generator functions, which use yield to return values. Python generator functions can also consume values using a (yield) statement. In addition two new methods on generator objects, send() and close(), create a framework for objects that consume and produce values. Generator functions that define these objects are coroutines. Then, execution resumes, with value being assigned to the value of data. To signal the end of a computation, we shut down a coroutine using the close() method. This raises a GeneratorExit exception inside the coroutine, which we can catch with a try/except clause. The example below illustrates these concepts. It is a coroutine that prints strings that match a provided pattern. The call to __next__() causes the body of the function to be executed, so the line "Looking for jabberwock" gets printed out. Execution continues until the statement line = (yield) is encountered. Then, execution pauses, and waits for a value to be sent to m. We can send values to it using send. When we call m.send with a value, evaluation resumes inside the coroutine m at the statement line = (yield), where the sent value is assigned to the variable line. Evaluation continues inside m, printing out the line if it matches, going through the loop until it encounters line = (yield) again. Then, evaluation pauses inside m and resumes where m.send was called. We can chain functions that send() and functions that yield together achieve complex behaviors. For example, the function below splits a string named text into words and sends each word to another coroutine. Each word is sent to the coroutine bound to next_coroutine, causing next_coroutine to start executing, and this function to pause and wait. It waits until next_coroutine pauses, at which point the function resumes by sending the next word or completing. If we chain this function together with match defined above, we can create a program that prints out only the words that match a particular word. The read function sends each word to the coroutine matcher, which prints out any input that matches its pattern. Within the matcher coroutine, the line s = (yield) waits for each sent word, and it transfers control back to read when it is reached. A Filter uses (yield) to consume items and send() to send result to a next step. A Consumer uses (yield) to consume items, but does not send. The function read above is an example of a producer. It does not use (yield), but uses send to produce data items. The function match is an example of a consumer. It does not send anything, but consumes data with (yield).We can break up match into a filter and a consumer. The filter would be a coroutine that only sends on strings that match its pattern. And the consumer would be a function that printed out lines sent to it. When a filter or consumer is constructed, its __next__ method must be invoked to start its execution. Even though the name filter implies removing items, filters can transform items as well. The function below is an example of a filter that transforms items. It consumes strings and sends along a dictionary of the number of times different letters occur in the string. We can use it to count the most frequently-used letters in text using a consumer that adds up dictionaries and finds the most frequent key. To run this pipeline on a file, we must first read the lines of a file one-by-one. Then, we send the results through count_letters and finally to sum_dictionaries. We can re-use the read coroutine to read the lines of a file. A producer or filter does not have to be restricted to just one next step. It can have multiple coroutines downstream of it, and send() data to all of them. For example, here is a version of read that sends the words in a string to multiple next steps. First, read_to_many calls send(word) on m. The coroutine, which is waiting at text = (yield) runs through its loop, prints out a match if found, and resumes waiting for the next send. Execution then returns to read_to_many, which proceeds to send the same line to p. Thus, the words of text are printed in order.